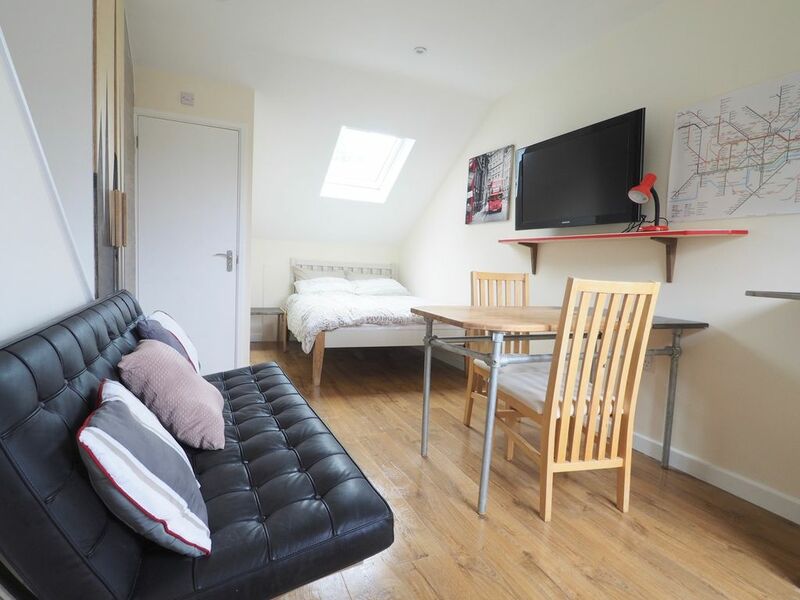 This Lovely London Loft Style studio has everything that you may need for a short stay in London. It can sleep 3 people, 2 on a double bed & the 3 person on a single fold up bed. We are Located within a 5 minute walk from Poplar All Saints DLR Station & 15 minutes walk from Canary Wharf. The Studio has its own En-suite bathroom with Toilet, shower & basin. This Studio is a nice comfortable size & is big on convenience. Laminate Wood floors & a full central heating with instant hot water. The Wardrobe has clothes hangers, an iron & ironing board, a hair drier & also a fan if the weather gets hot. TV fans will love the 40" smart TV with all the modern features, like Netflix etc as well as fibre optic high speed internet. A Large designer table & 2 chairs, an electric Euro adapter is provided & also a table lamp. This is a new build property just built in 2018. This is the first time I've ever given a 3/5 review because I'm usually easy to please. The property looks like it was recently renovated so the walls were crisply painted and the bathroom looked brand new. The space is small, but in a comfy way that was fine for me. A TV dominates the room if you want to watch something and the desk is a good size if you need to do work... which I did. A fridge is provided along with a new microwave and dishes. All in all, it is a comfortable space. My main issues with the property involve how the space was managed when I arrived and questions around hygiene. For my arrival, there was confusion around getting in touch with my contact despite leaving multiple messages. This left me waiting an extra two hours before I could get into the apartment. My concerns about hygiene are pretty simple. The bed did not have a second sheet so I had to sleep under a comforter without the a sheet. Next, when I went looking for another pillow I found it sitting in the upper closet on a dirty plate. When I took it off the plate, some of the dark matter flaked off onto the floor. Finally, for soap there was anti-bacterial hand soap and what appeared to be a used bar of soap in the shower. None of these are good from a hygiene point of view. My recommendation is that the owner pays closer attention to the little details that take an apartment from good to great. Please make sure the property is clean and error on over communicating with the customer. I rent a space too and I find it is the little details that count.